And I went inside to live some history. Here’s the actual entrance to the museum on the backside of the building. If you walk straight down that sidewalk you’ll run into the main road that leads to the right past Dealy Plaza. 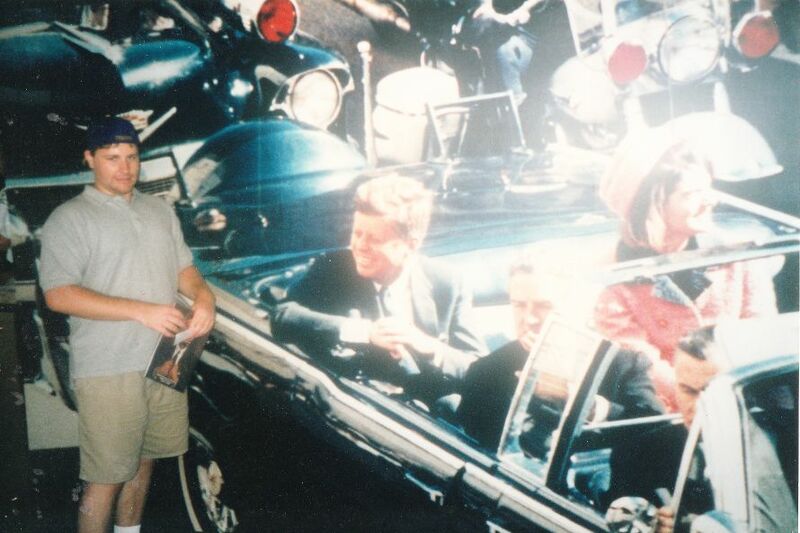 Just inside the museum doors before you get into the museum proper is a giant mural of Kennedy in the Presidential limousine just before he was shot. I went to look at it and one of my friends snapped an impromptu pic of me. I wasn’t ready for the pic which is why I look like I’m not ready. Pictures aren’t allowed once you are inside. I’ll just tell you, there are a lot of pictures from the time on display. There are several “to scale” models of the plaza with trajectories and mock ups of the actual shooting. 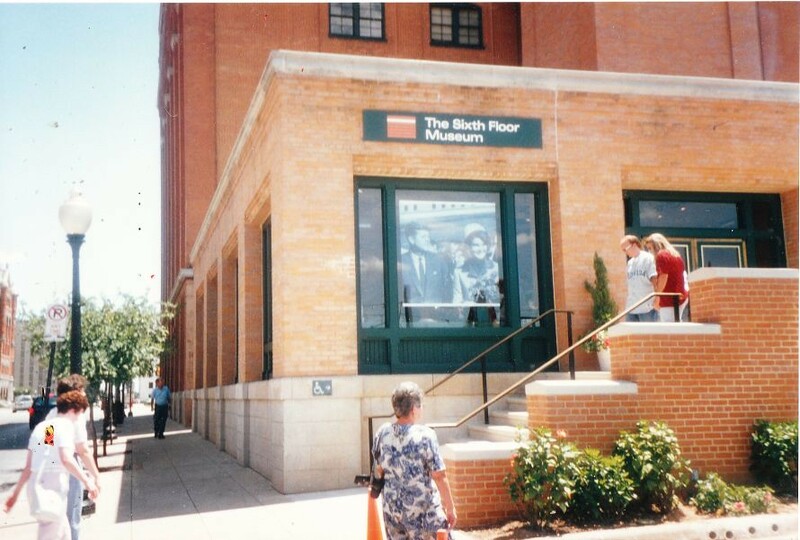 They even preserved the corner on the sixth floor where Oswald shot at the President. It’s called the “Sniper’s Nest”. It’s well done and interesting to see, but a bit sad as well. And, like I said, it just felt ominous. I’m glad I went though. 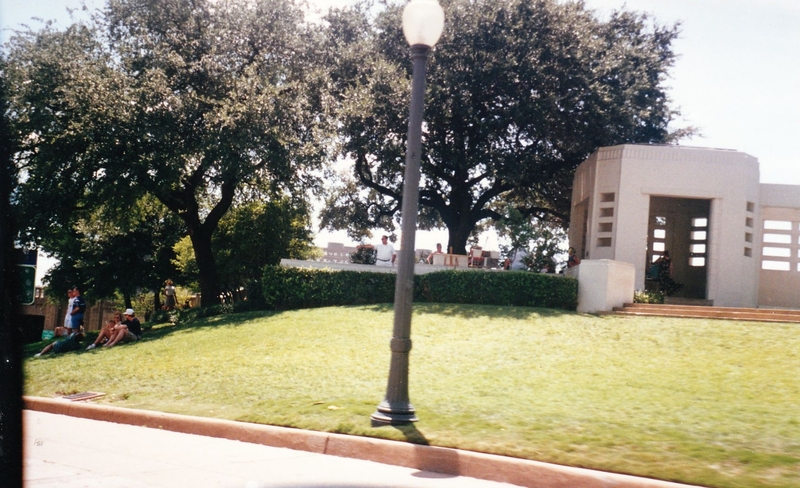 After the museum I again walked over to stand on Dealy Plaza where Zapruder shot his famous footage and I walked again over to the grassy knoll to see where in 1963 there were possibly sharpshooters to help Oswald complete his task. Walking on Dealy Plaza was eerie and a little disquieting, but again, I’m glad I did it. 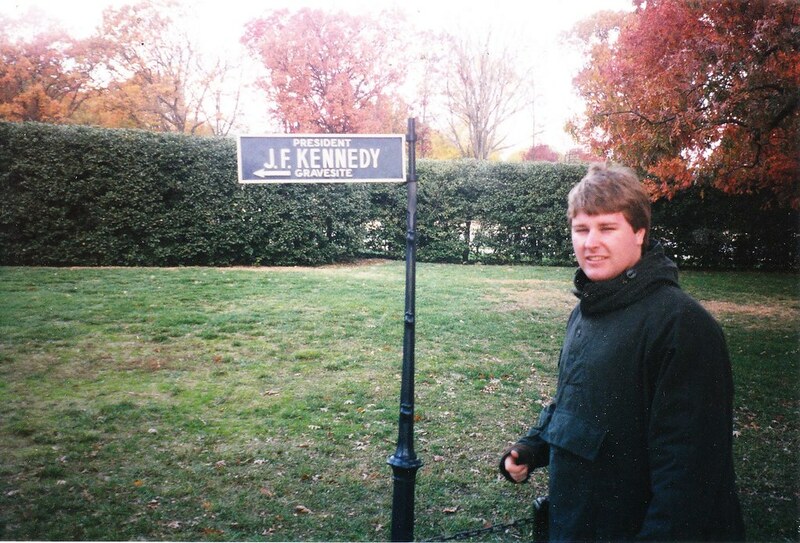 A few months later in early November, I visited a friend who was on assignment in Washington, DC. This friend was one of the guys who went to Dealy Plaza with me in Dallas. I was there to attend the Smithsonian’s Star Wars: Magic of Myth exhibit which had just opened the week before. 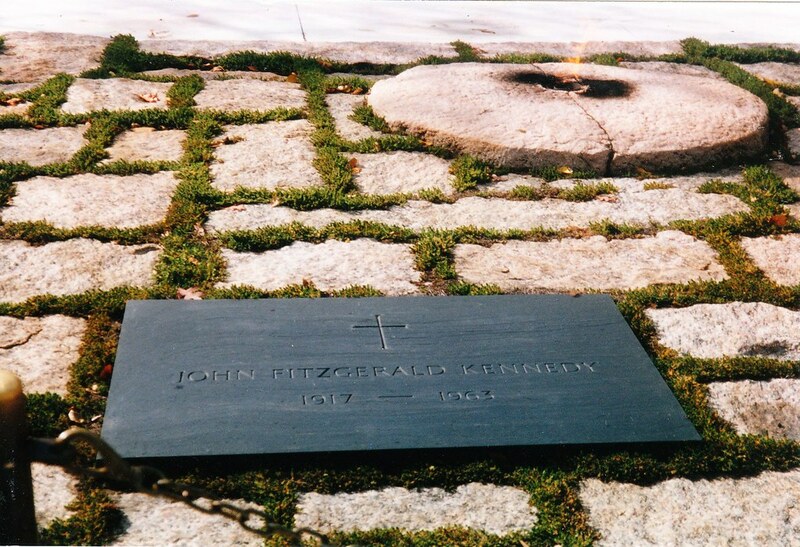 While in the city we visited Arlington Cemetery and visited Kennedy’s final resting place. And the Eternal Flame. I’m glad I was able to see both of these places only months apart. 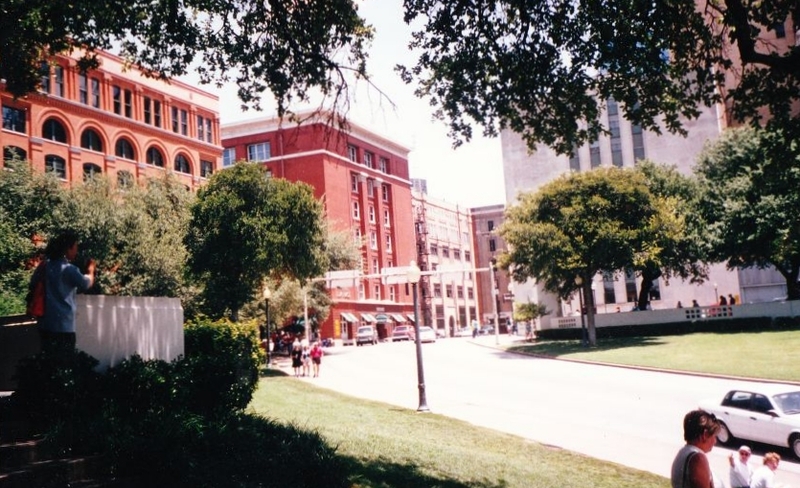 I still find myself fascinated with the investigations into Kennedy’s assassination. To wrap up, here are a few of the things I’ve read and watched pertaining to this touchstone in American pop culture. The Men Who Killed Kennedy – A British documentary that thoroughly examines the events surrounding the assassination and directly accuses Lyndon B Johnson as a guilty party. Originally aired in 1988 in the UK, it was added to and rebroadcast in the US in the late 90s by the History Channel which is where I recorded it onto VHS. For the most part, it is no longer aired, but you can still by it on home video. It’s actually a very engrossing documentary and presents a lot of convincing evidence of government conspiracy. On the Trail of the Assassins – Jim Garrison – This is the book that inspired Oliver Stone’s movie, JFK . Which I would include in this list if I didn’t just now mention it. Garrison’s book delves a bit deeper into the details than Oliver North’s movie and gives a more complete story. Highly recommend. 11/22/63 – Stephen King – This is a completely engrossing story involving time travel and a “what would happen” scenario. King really delivers on this book, it is EXCELLENT. As a matter of fact it made my “Best Books I Read in 2012” list. This entry was posted on November 22, 2013 at 7:00 am and is filed under nostalgia, pop culture, roadtrip with tags anniversary, Nerdy Roadtrip, nostalgia, pop culture, roadtrip. You can follow any responses to this entry through the RSS 2.0 feed. You can skip to the end and leave a response. Pinging is currently not allowed. Well done, Pax, a magnificent presentation in every respect. This is one of three events from my lifetime that are frozen for me, where I can see everything that was going on around me like it happened five minutes ago (the others are the Challenger explosion and 9/11). I was in tenth grade in Monterey Union High School. A lot of the kids went home for lunch, and they came back talking about the shooting. He hadn’t been pronounced dead before they had to return to school, so the next few hours were spent in an uneasy limbo until some of the teachers got to the lounge on their breaks and completed the story for us. In any case, a fabulous job. I’m going to put Mrs. Jack onto this article. She loved JFK more than I did, if anything, and this is as tastefully executed as anything we’ve seen on TV in the last week. You’ve raised the bar for yourself, my friend. Best of luck holding to the new standard! Very nice post, thanks for sharing it. I can only imagine how eerie it must be to visit these places. I wasn’t born when JFK was killed, but it’s just one of those historical events that is heart wrenching, to watch on film and to learn about. He seemed like such a beloved President. My daughter came home a few weeks ago talking to me about it as they learned about this in school. Her teacher recalled the day it happened. I have 11/22/63 by King on Mt. TBR. I’ve only heard good things.